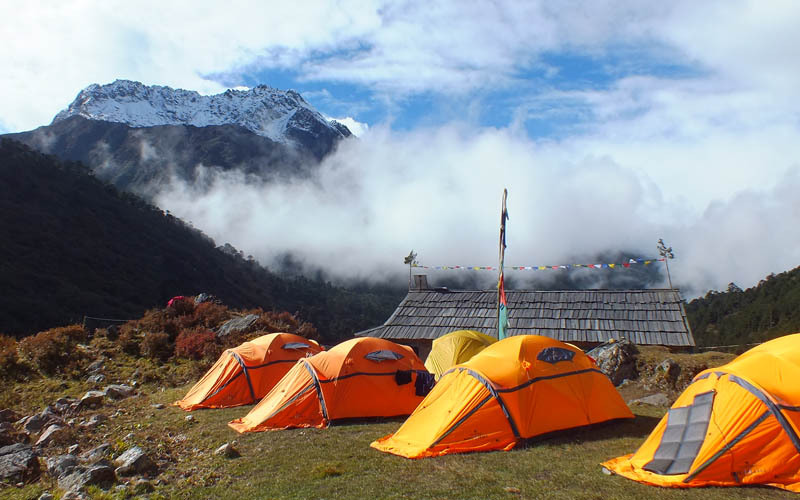 Kanchenjunga Base camp Trekking is one of the beautiful but challenging trekking destinations in Nepal. Kanchenjunga Conservation Area which is spread in an area of 2,035 square Kilometers. Mount Kanchenjunga (8,586m) is a third-highest peak in the world that has signified the place for mountains lover. More importantly hiking into two base camps (south and north) in a trip has made dynamic place to visit. Basically hiking through hilly villages to high passes, lovely vegetation, reaching two Base camps, various ethnic people, high mountains, lovely glaciers and far horizon view and valley that has made great combination of varieties. 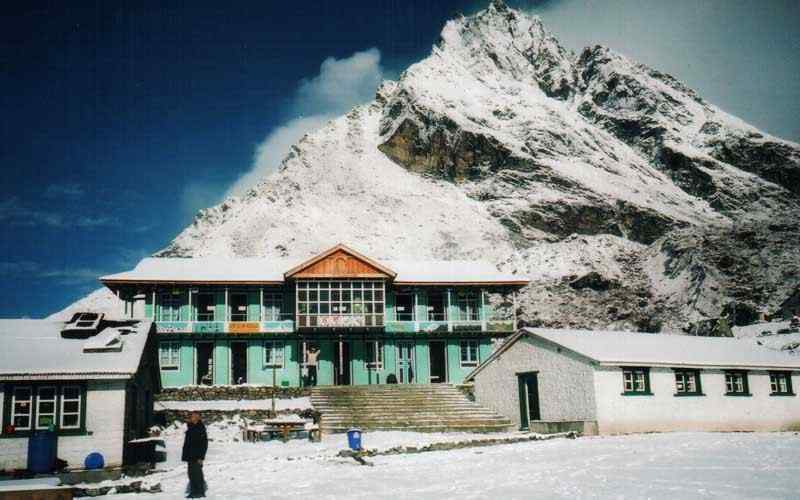 Kanchenjunga Base Camp Trekking starts with hiking through the Mediterranean climate of mid hills. More importantly the arctic landscape, spectacular views of scenic mountains, rural life style and native cultural people are highlights the journey. Visitors gets amaze because of Rai, Limbu, Bhotias and Sherpa settlements who has lovely welcome nature and gracious hospitality. 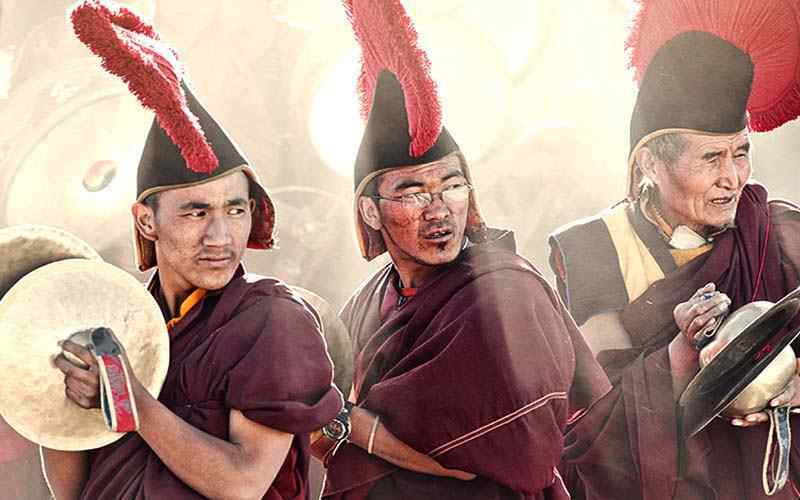 It is a lengthy trek disappearing deep into far-flung mountain ranges on the border with Sikkim and Tibet. After several days of trekking, we reach into south base camp which is first Kanchenjunga base camp for Expeditions led by George Band in 1954. We continue hiking traversing scenic passes of Selele Pass. Selele Pass considered as one of the challenging pass that has two other passes Mirgin La and Sinelapche La pass together to go through. We reach Ghunsa at 3480 m that is a first village after the pass. The trekking continues towards north Kanchenjunga base camp. We walk through the glaciers and moraine to reach Pang Pema (5065 m). The visitors get amaze with the spectaculars and midst of tall mountains overlooking massive Kanchenjunga in a very close range. The lovely views of thumbing ice fall and glaciers are making bliss. After the life time achievement, Trexmount Ventures has set itinerary to make return journey. The returns journey comes through enthralling scenery, lovely forest and terraced fields. This return journey may give you chance to see wildlife including snow leopard, Himalayan black bear, musk deer, red panda. The major birds found in Kanchenjunga trekking route are Impheyan, pheasant, red-billed blue magpie, shy drongo. We will be completing the hiking at Suketar and drive through beautiful tea gardens to Iilam. Good bye to the Kanchenjunga area as we will take flight from Bhadrapur to Kathmandu. Day 03: Fly to Bhadrapur (240 m-787 ft) and drive to Ilam (1,460 m-4,790 ft) – 04 hrs. Day 04: : Drive to Sukhetar and trek to Lali Kharka (1,900 m-6,233 ft) – 07 hrs. Day 05: Trek to Kande-Bhanjyang 2,100 m-6,889 ft – 05 hrs. Day 06: Trek to Mamangkhe (2,030 m-6,660 ft) – 06 hrs. Day 07: Trek to Yangphudin (2,150 m-7,053 ft) – 06 hrs. Day 08: Trek to Chitre (2,880 m-9,448 ft) – 06 hrs. Day 09: Trek to Simbua Khola (3,000 m-9,842 ft) – 07 hrs. Day 10: Trek to Tseram (3,770 m-12,369 ft) – 05 hrs. 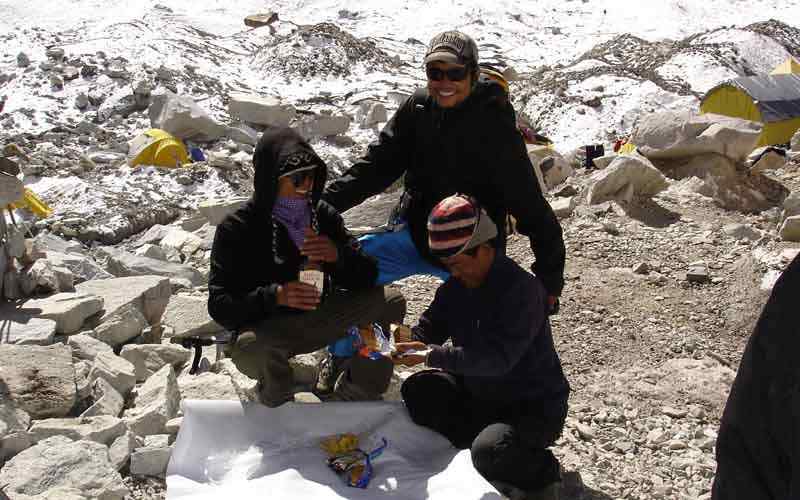 Day 11: Trek to Ramche (4,360 m-14,304 ft) via Lapsang – 05 hrs. 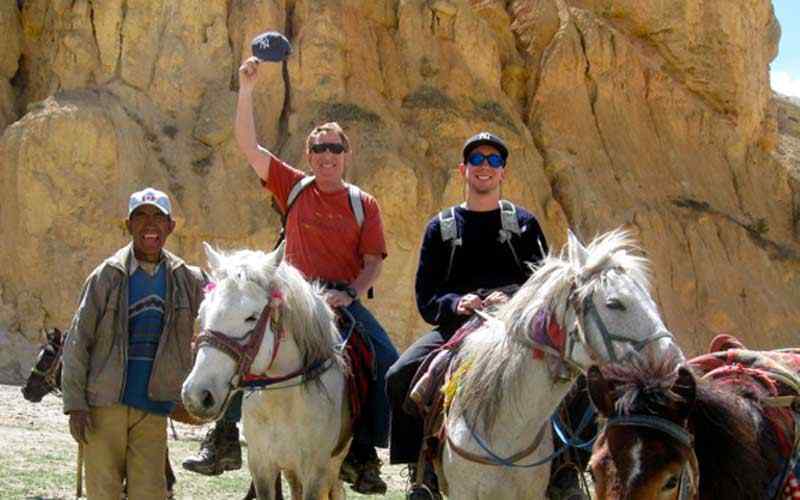 Day 12: Ramche and Excursion to Kanchenjunga South base camp. Day 13: Trek back to Tseram – 04 hrs. Day 14: Trek to Tamo la (4,300 m-14,108 ft) – 05 hrs. Day 15: Trek to Ghunsa (3,480 m-11,417 ft) – 06 hrs. Day 16: Trek to Kangbachen (4,000 m-13,123 ft) – 05 hrs. Day 17: Trek to Lhonak (4,780 m-15,682 ft) – 06 hrs. Day 18: Trek to Pang Pema (5, 065 m-16,617 ft) – 05 hrs. Day 19: Pang Pema, Kanchenjunga North Base Camp Exploration. Day 20: Trek to Kambachen (3,900 m-12,795 ft) – 07 hrs. Day 21: Trek to Phale (3,100 m-10,171 ft) – 06 hrs. Day 22: Trek to Amjilassa (2,500 m-8,202 ft) – 07 hrs. Day 23: Trek to Tapethok (1,300 m-4,265 ft) – 06 hrs. Day 24: Trek to Phoram (1,650 m-5,413 ft) – 06 hrs. Day 25: Trek to Suketar (2,440 m-8,005 ft) – 05 hrs. Day 26: Drive to Fickal or Bhritamod / Bhadarpur. Day 27: Fly to Kathmandu from Bhadarpur and transfer to hotel. Our representative will come to the airport for transfer to the Hotel. After some refreshment in the hotel, Our Tour leader will conduct a pre departure meeting in the Hotel or at our office. The meeting will covers trip related information & the collecting your Documents (passport copy, 2 passport size photos, Travel insurance copy). Breakfast, free day for trek preparation. 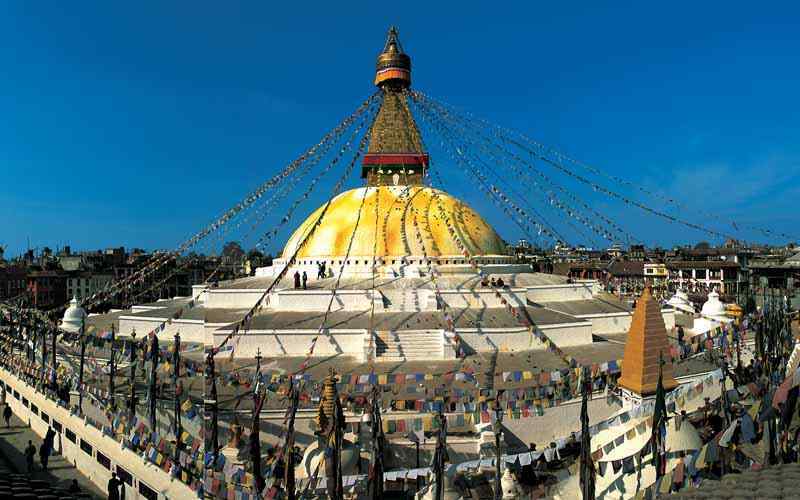 You can do your own activities OR, you can do sightseeing tour in Kathmandu valley with visiting fascinating world heritage and cultural sites. There are few places that are worth to visit such as Hindus holy Pashupatinath temple, Bouddhanath Stupa, Swayambhunath (Monkey Temple), Durbar Squire ( One is in Kathmandu, in patan and also in Bhaktapur), Museum, monasteries, old historical Palaces and Gardens. Note: this tour is optional so you can visit with place of your interest & pay locally. Meals included: Breakfast. We drive to the airport for the flight to Bhadrapur plane for a super scenic flight towards Far South East of Nepal near India border, overwhelming views of mountains from Ganesh, Langtang, Jugal Himal to Everest, Makalu and Kanchenjunga range, after 45 minutes of pleasant flight reaching the warm sub-tropical area at Bhadrapur and then have an interesting drive towards mid hill around cooler area at Ilam town for overnight stop in local simple hotel, this area is famous for tea gardens. 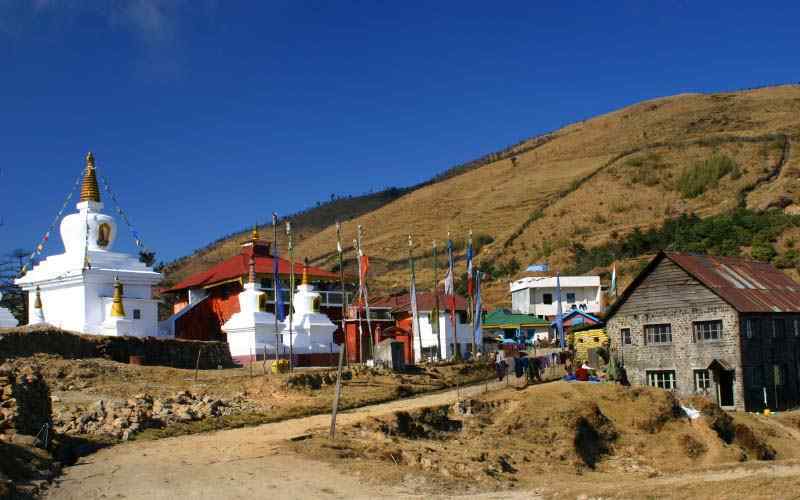 Another good drive leads in the morning from Ilam town to begin this adventure at Sukhetar in Taplejung area, this interesting and scenic drive leads over hills and valley on the rough dirt road following the Kabeli river all the way to Sukhetar for 3-4 hours drive. 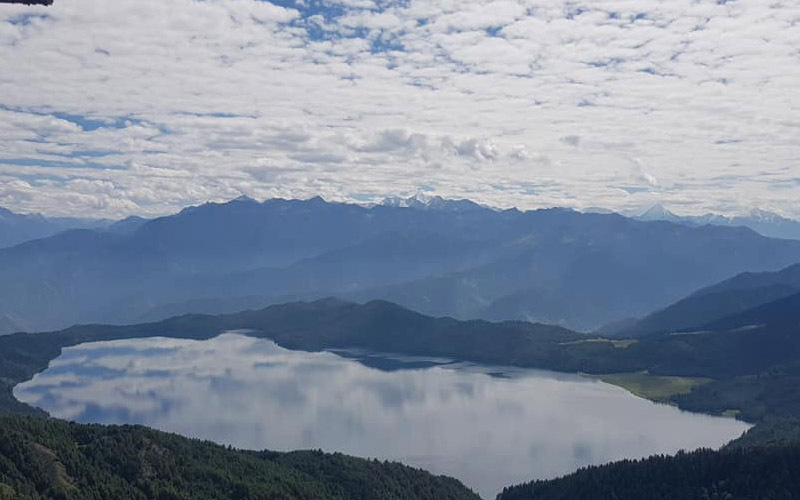 Sukhetar is a small village of Taplejung area with a small airstrip with 2-3 a week flights from Kathmandu via Biratangar city, which is quite unreliable due to less passengers and weather condition, so using an alternative way to start this trekking. From Suketar, first day walk starts towards Lali Kharka a small farm village at 2,260 m–7,414 ft, the first section on the gradual winding trail into thick pines and rhododendron forest; walk continues following a scenic ridge with some gradually descends to Lalikharka for overnight stay, offering excellent views of Kanchenjunga. Our second day walk leads to a descent passing farm villages and well maintained farm fields with terraces growing wheat, millet, around the area with people of Hindu origin, mixture of Brahmins, Chettris and Kirat tribes Rai’s and Limbus and worship Hinduism along with their own old traditional culture. On reaching Tembawa village, we descent towards Phawa khola, crossing Phawa khola reaching at Pokora village, from where we will be hiking into nice terraced farms, and then crossing a bridge with a climb on the steep hill top to Kande- Bhanjyang via Kunjari village with super views of Kanchenjunga and Yalungkang peaks. Morning starts by descending, leaving this nice village to a more farming area, and then through forest to Nandeva khola, after crossing the stream. 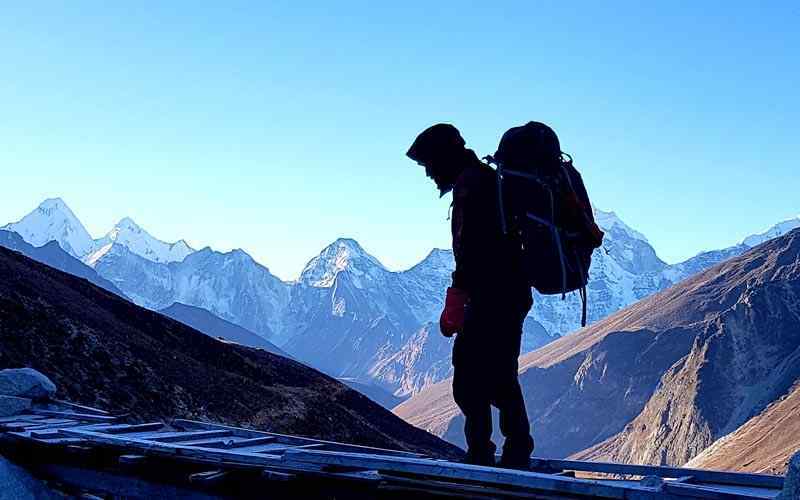 We have to ascend through thick tree lines reaching at Lopoding village, from here on the mix trails with few ups and down to Fun-Fun village, offering a marvelous vista of Khumbakarna Himalaya range with Yalung and Mt. Kanchenjunga. From this view point, we descends again through farm terraced, and then climbs for an hour to Pomppe Dhada on a ridge with super views of Mt. Jannu towards North. After catching the wonderful scenery on the downhill path to Khesewa khola, cross a suspension bridge with a final climb of the day to reach a terraced farm at Mamankhe village for overnight stop. We start with gentle uphill, Skirt the ridge line to reach a level path to Dekadin village. 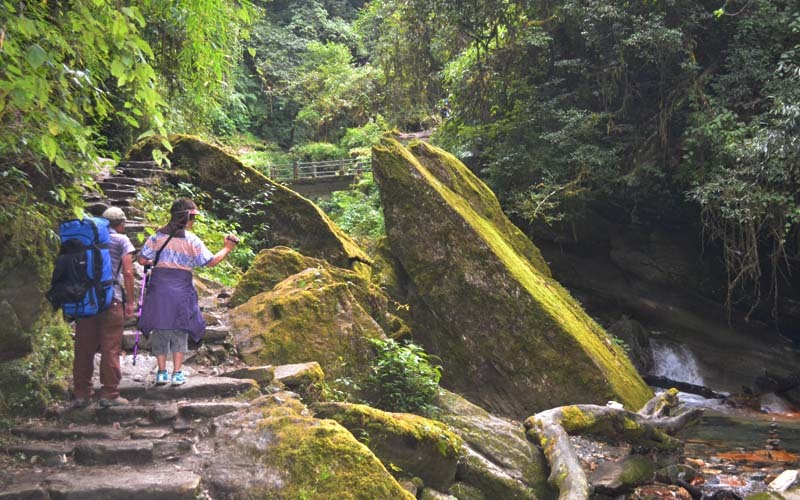 We walk through the Kabeli khola bank and Climb nearly 300 meters above the river with the winding trail onto ridges, streams, and then we walk downhill towards Kabeli khola. After leaving the river climb through farm fields and villages to reach Yamphudin for overnight stay. We follow the bank of Kabeli khola and rossing Omje khola, a tributary stream. Climb to Dhupi Bhangyang reaching a wide exposed grassy field. Walk downhill through a deciduous forest to Omje Khola and into the cool shade of rhododendron tree to a ridge at small village Chitre for overnight. We do hike towards Ramite Bhanjyang. Climb a steep uphill through forest of beautiful magnolia, rhododendron and bamboos. Reach Ramite which has a few small huts. 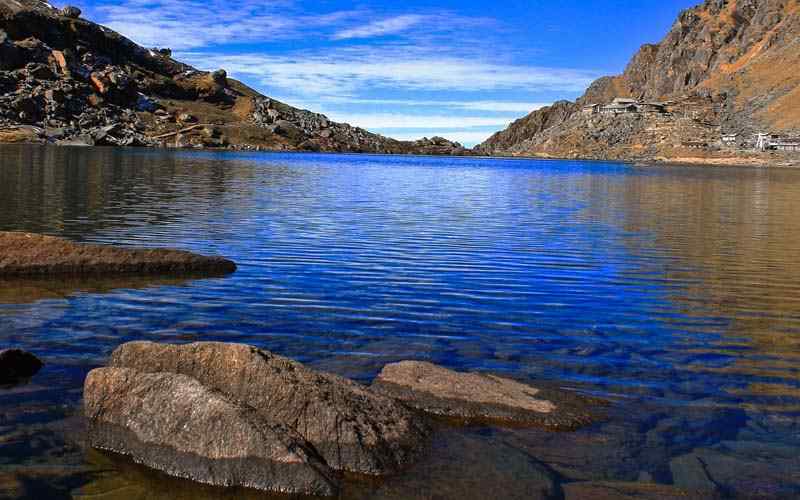 We continue hiking through the rhododendron forest passing a small pond to reach Ramite Bhanjyang at 3,430 m–11,253 ft. There is superb view of Mt.Jannu, Mt. Kanchenjunga, Mt. Khumbhakarna and the Kabru peaks which can be seen between tree lines. We descend to the riverbed of Simbua Khola for overnight. We follow the river banks passing small bivouac caves. We will be heading towards a mountain flank and into a forest area to reach Wahta. Wahta has a few huts that serve as shelter. Cross a stream and coming to a gravel ground. See a small shrine with a large boulder of a serpent shaped image. Leaving the wooded area walk towards the riverbed again, climb to Tserem for overnight stop. Tserem has several roofless bivouac caves. 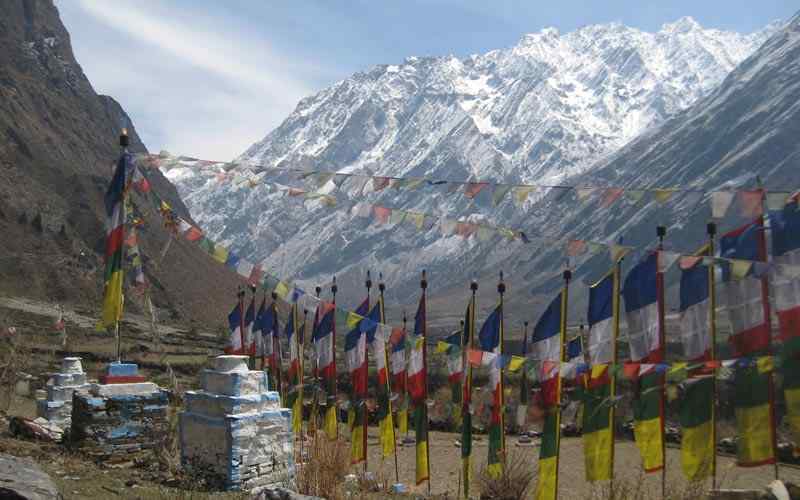 We have nice view of Yalung glacier, Kabru (7,353 m–24,124 ft) and Talung (7,349 m–24,111 ft) peaks. We start with descending to the Simbua Khola riverbed and climb up a terraced hill side to reach Yalung Bara with single stone hut. This hut marks the end of the tree line and forest. We hike towards the Yalung Glacier ablation zone of South Face of Kanchenjunga after here. After a good walk with a break in between, we have to climb for an hour to Yalungbar and then to the small place of Ramche for overnight. 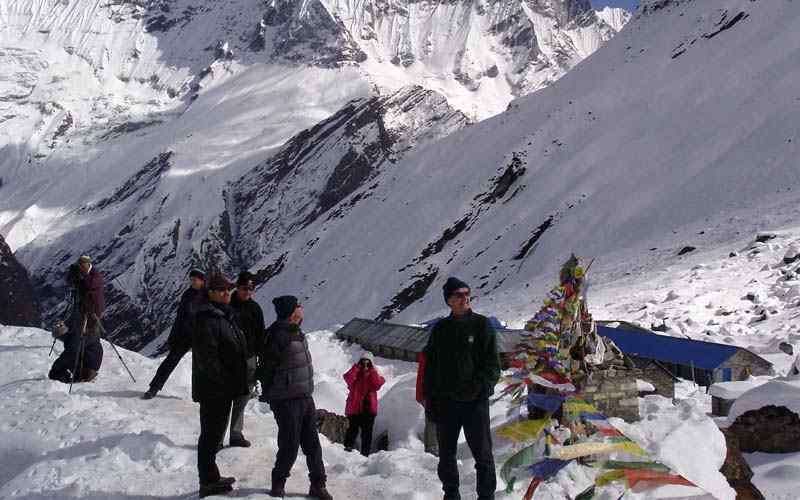 Enjoy fantastic views of Kabru, Rathong and Kokthang adjoining peaks of Kanchenjunga. After breakfast we go to explore Kanchenjunga South Base Camp, one of the highlights of this adventure. Walk for about two hours at an altitude of over 4,600 m–15,092. 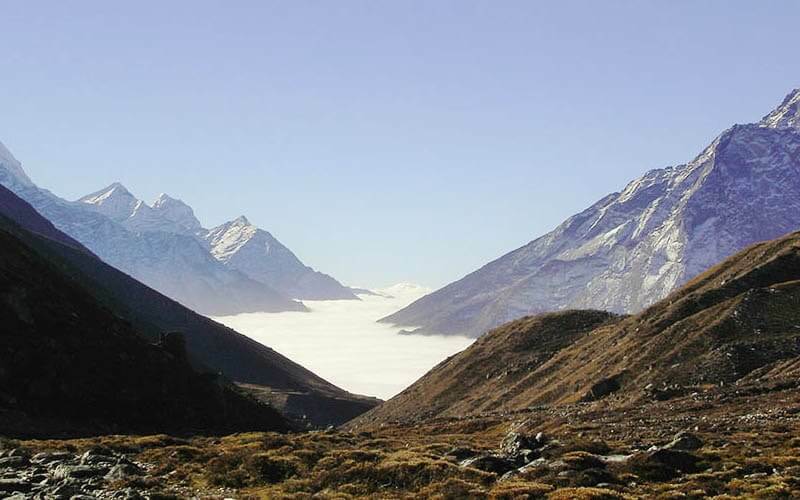 Enjoy clear views of Yalung Glacier and South Face Wall of towering Mt. Kanchenjunga. This place was the first and classic route to Kanchenjunga summit, by British Expeditions to Mt. Kanchenjunga with great views of Talung and Kabru Peak, after a nice and scenic hike with awesome vista return back to Ramche. From here retrace walk back to Tserm on a downhill track most of the way to and back to the tree line. Enjoy the walk with views along the way to Tseram for overnight. Descend through Yalungbar with short steep up. Cross a river then make a gradual climb through forest up a steep hill for an hour. Reach two small glacial ponds. Enjoy a strenuous walk up and down to cross the three passes of Mirgin La, Tamo La and Sinion La. The first portion climbs for an hour to top of the Mirgin –la pass to take-in great view of Kabru peak and Mt. Kanchenjunga. It is a significant day with crossing three high ridges in one single day. 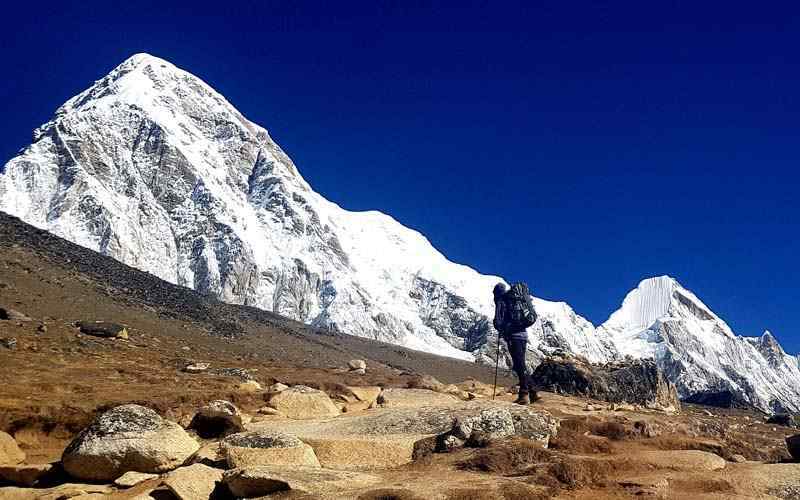 From Mirgin La, the trail leads downhill and then up to Sinion La at 4,500 m-14,764 ft. Descend gently to Tamo La at 4,500 m–14,764 ft. enjoy the super views of the Khumbhakarna Himalaya range. We descend towards overnight. Heading towards North Kanchenjunga Base Camp from here, and hike on a gradual path with a steep descent for an hour through rhododendron and pines forest, Continue downhill near the Ghunsa River. Walk on a pleasant and gradual path to Ghunsa village. 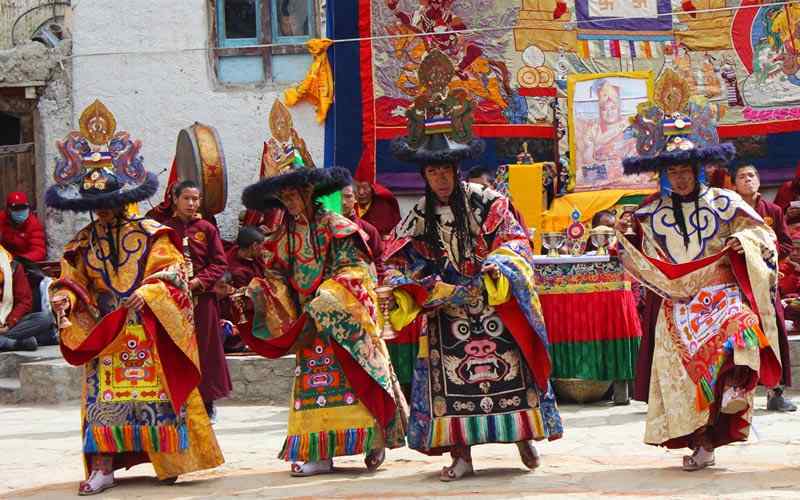 Ghunsa is inhabited by a large Bhotia ethnic tribe of people with Tibetan origin. They live in a community with stone houses. Start the morning with an uphill climb along the river side, there are several cascading waterfalls. Reach Yak herders’ shelters along the trail. These are used depending upon grazing season. Our hike continues along the Ghunsa River through a rhododendron and pines forest. We have a gentle climb to Rambuk Kharkas to cross a small glacier with landslide sections with wonderful views of Khumbukarna Himal and Janu Himal and other high snow capped peaks. Leaving the tree lines behind enter a barren terrain with few sparse vegetation of junipers and Burberrys bushes. The walk gently downhill to Kangbachen for overnight with superb views of Mt. Sharphu (7,070 m–23,196 ft), Mt. Janu North Face and Wedge peak. After a lovely time with awesome scenery, walk above the river for an hour heading toward the North East. The path leads down to the river. 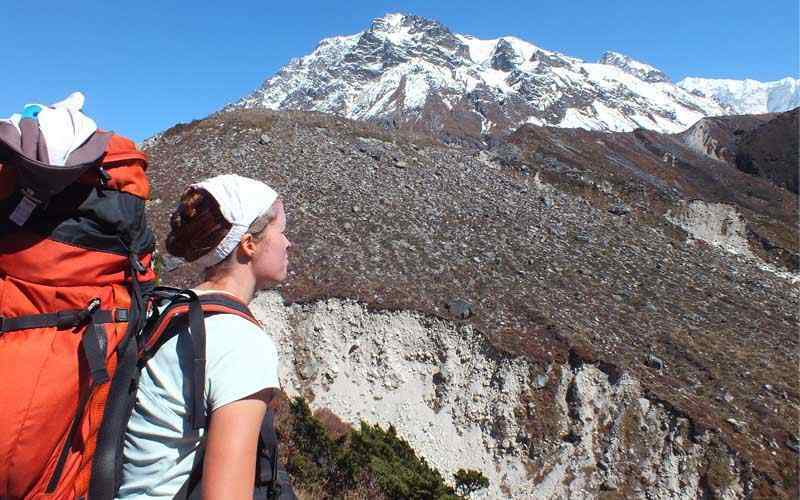 Climb over a boulder track to the terminal moraine of the Kanchenjunga glaciers. Cross at the junction of the Lhonak and Kanchenjunga glacier to reach Lhonak. We start with gradual hiking through the rocky and moraine path to reach Pang Pema which is near to North Base Camp. There are massive view of Mt. Kanchenjunga range, Kirat Chuli, Nepal Peak, Taple Sikhar, and Givegela Chuli. There are also possibility to see some wildlife like a group of blue sheep, mountain antelopes and the rare snow leopards, if lucky. Climb up at Pang Pema Peak (5, 065 m-16,617 ft) for the best mountain vista. 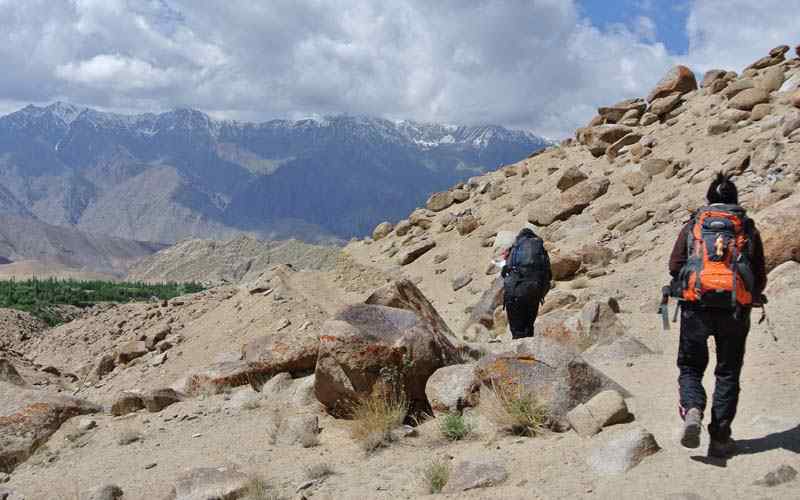 The climb is a mixture of boulders, moraine and grassland. 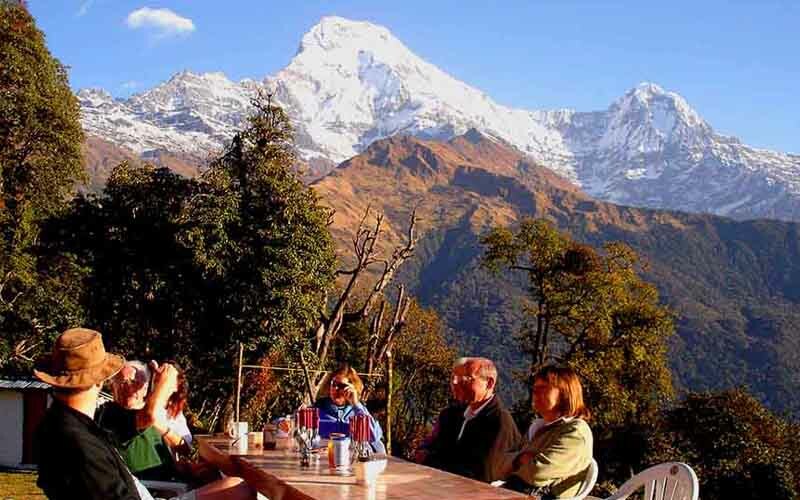 From the top have breathtaking views of Kanchenjunga, Kumbhakarna, Makalu, Cholotse, Sharpu, Drohma, Nepal Peak and range of other adjoining peaks. After a memorable and fantastic time at Pang Pema near the Kanchenjunga North Base Camp, Hike long way downhill and with a few short climbs. Retrace same route to Kambachen. From this remote and high small village walk downhill with few short climbs, retrace the journey back by the same route to Ghunsa. After crossing Ghunsa Khola, we have a pleasant walk back to wooded pine forest to Phale for overnight. The return journey continues descending towards green vegetation and back into mix forest of bamboo and rhododendrons. 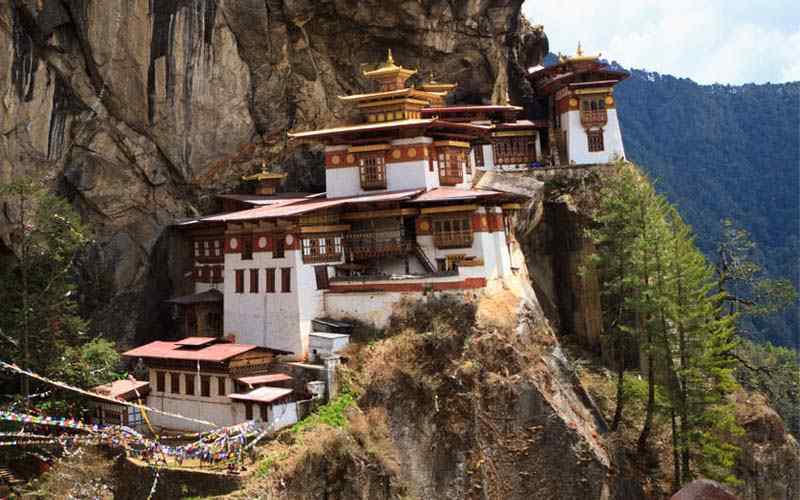 Before Gybala village, make a short steep climb along the bank of Ghunsa River. Climb. Descend for an hour with steep ups and downs for few hours. 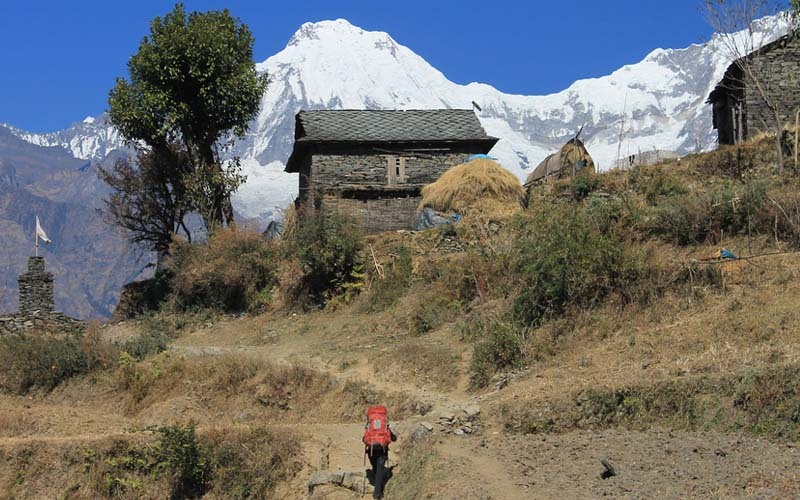 Move through a forest and finally reach open grassland at Amjilassa, a small Sherpa village with overnight. Getting back to a warmer climate see more farm lands and villages. We have a gentle descent through open grassland to Ghaiya Bari and Sekathum villages. From Sekathum cross Ghunsa and Simbhu Rivers, Follow Tamur River to reach our overnight at Tapethok village of Limbu (Subba) Kirat people. We continue on the bank of Tamur River to Chiruwa village. Trek for an hour through farm villages then uphill into a forest of rhododendrons, oaks and pines trees to reach Phoram village. We hike through many villages and through enchanting cool forest of the mid hills. The people here are of mixed race. The walk is a steep up for couple of hours followed by a gradual and pleasant walk all the way to Taplejung village at Suketar. After a fascinating journey on the high hills and mountains, drive in a local jeep or similar to Fickal or beyond through Ilam town as time permits, Ride through vast tea gardens and rolling hills till Fickle town is reached. 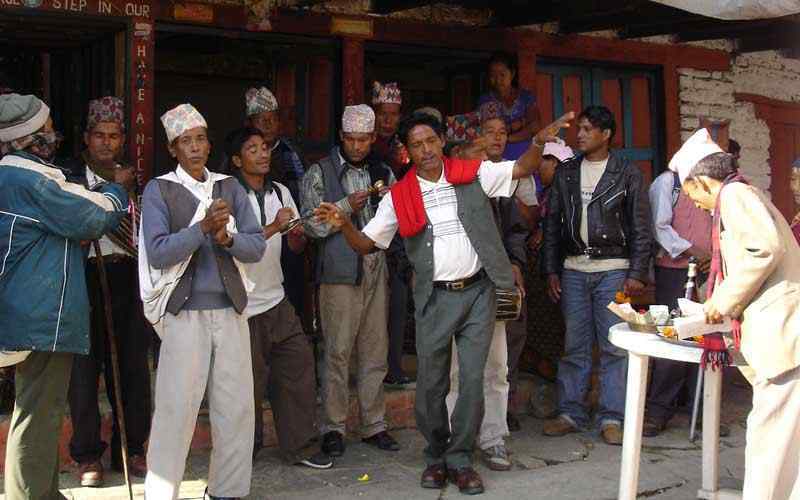 Continue the drive towards the main highway to Bhirtamod or Bhardrapur town to catch a flight back to Kathmandu. Transfer to the Bhadrapur airport in time for a scenic flight back to Kathmandu. Board the plane and take in spectacular views during the 45 minute flight. Upon reaching Kathmandu, transfer back to hotel. Free day for your own Activities, Farewell dinner. we will transfer to Tribhuvan International airport for the flight from Nepal. Airport Pick up and drop transfers. An experience Trained guide and required number of porters (one porter in between two pax), their food, accommodation, transportation, salary, insurance, and equipments.